What are the best investment options in India for NRIs? As an NRI, you can invest in direct shares or ETFs (exchange-traded funds) both on repatriation and non-repatriation basis. Aditya, an NRI (non-resident Indian), works as a software engineer abroad and has been looking to invest in India. However, he is quite clueless about the investments available for NRIs in and if there are a few, how to apply for them. After discussing it with one of his close friends Sharad, he got an insight into different investment options and how he could apply for them easily. Sharad informed Aditya that the latter first needs to have an NRE (non-resident external) or an NRO (non-resident ordinary) bank account, and a PAN (Permanent Account Number) after which he can explore different investment options. What are NRE and NRO bank accounts? How to open them? NRE and NRO are Rupee bank accounts for NRIs. You can visit any public or private nationalized bank to open these accounts. 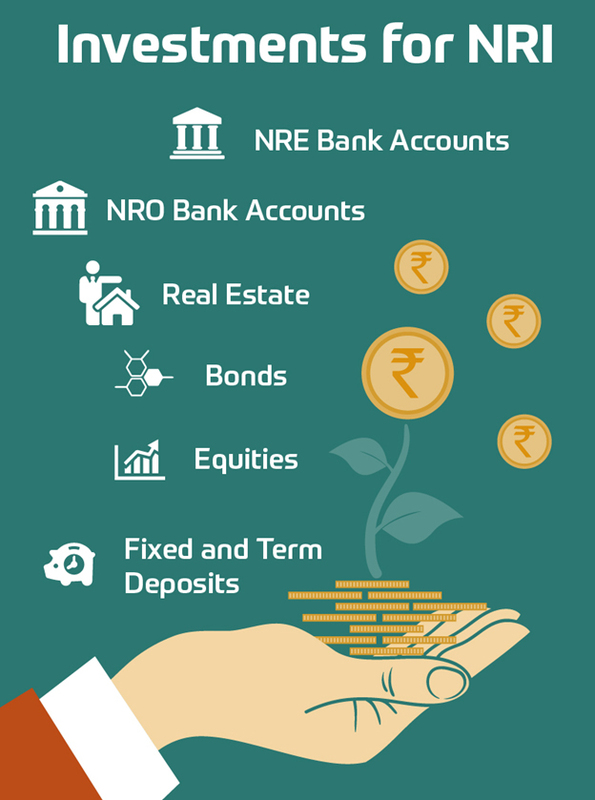 NRE account gives the reparability on both principal and interest amounts, while NRO account gives you the repaarability on amounts up to $1mn, including on principal and interest. With basic KYC (know your customer) details and supporting verification documents, you can easily open an NRE/ NRO account. NRE/NRO bank accounts: Apart from being required to invest in secondary markets, NRE/NRO accounts themselves are good investment avenues, if you are looking for safe options to park your money. You can choose an NRE or NRO account, whichever suits you the best based on the reparability they offer. FCNR (Foreign Currency Non-Resident) accounts: These are foreign currency term accounts offering tax-free interests and full-reparability, making them a good investment avenue for NRIs. Equity market: As an NRI, you can invest in direct shares or ETFs (exchange-traded funds) both on repatriation and non-repatriation basis. To invest in the equity market, you need to open a demat and a trading account with a registered broker by getting a permission letter from the RBI (Reserve Bank of India) under PIS (Portfolio Investment Scheme). This PIS letter allows you to invest in the secondary markets. Real estate: As an NRI, you can invest in the blooming real estate market via investment in commercial or residential properties. Investments in agricultural and farm lands are restricted to NRIs, but you can still own it if they have been gifted or inherited. All settlements subjected to real estate are to be done via NRO accounts only, which have repatriation restrictions. Bonds and NCDs (non-convertible debentures): You can invest in bonds and NCDs issued by the government, PSU (Public Sector Units), and private corporates for better liquidity and to get better returns. To make these investments, you need to have an NRE/NRO bank account and a PIS permission letter. Fixed and term deposits: A bank fixed deposit is where you invest for a fixed lock-in period and get returns. Term deposits, on the other hand, also come with a lock-in period and are offered by various banks, NBFCs (non-banking finance companies) and even some private companies. If the investments are made via NRE account they are tax-free, while the ones made by NRO account are subjected to TDS (tax-deduction at source). Mutual funds: There are domestic mutual funds that invest in different equity and debt securities, which are available for investments for NRIs. These offer good returns and do not require monitoring as in the case of investment in direct equities. National Pension Scheme (NPS): You can also invest in NPS if you have retained your Indian citizenship and want to retire in India. NPS is tax-effective and follows EET (Exempt-Exempt-Tax) structure for taxation. NPS offers good returns and can be seen as a good investment avenue. With a fleet of opportunities available for NRIs to invest in India, Sharad can build a good amount of wealth by strategically investing in these avenues.